Real life application of critical thinking skills is important. With strong critical thinking skills you will be able to work smarter, not harder. To help learn these important skills, Critical Thinking Keys and Secrets of Basic Management Skills have been created. This training system has been developed to help you learn how to make practical decisions, save money, do projects quickly, free up time, lower frustrations and create an exciting future. Critical Thinking Keys and Secrets of Basic Management Skills includes both: The essence of the Re-Discovery of Common Sense Book and a Workbook to teach you how to make great decisions, solve problems and think through tough situations. The Re-Discovery of Common Sense is an easy to understand book. It eliminates the mystery of decision making and provides an easy step by step process. It also teaches how to do projects quickly and effectively. Cartoons, practical examples, and fascinating stories make a tough subject non-intimidating. The book is entertaining and educational. You will enjoy learning! The book has two purposes. First, it provides strong fundamentals for critically thinking about any subject. Second, it acts as a great reference guide. Each chapter teaches a definitive subject presented in a clear, crisp and practical manner. Few words are wasted. 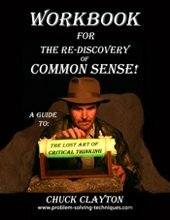 The Re-Discovery of Common Sense Workbook helps reinforce the ideas in the book. It provides exercises your students will enjoy doing. This helps you internalize what you have just learned from the book. Critical Thinking Skills not only improve your ability to think more clearly and accurately, they improve your problem solving and decision making skills. Are you ready to become a powerful critical thinker? Then...see Critical Thinking Keys for Students Secrets of Basic Management Skills on the right side of this page!